Discover the Secrets of Creating Delicious Easy-to-Make Homemade Herb and Spice Mixes in Just Minutes! Learn how to create fabulous herb and spice mixes from all around the world including Europe, Africa, America and Asia and add mouthwatering flavours and sublime aromas to your home cooking. Dear Fellow Food Lover, below is my recipe book showing you how to create and replicate the fabulous flavours and aromas from cultures and cuisines from all around the world. The book also shows you step-by-step instructions on how to toast and grind whole spices and combine with pre-ground powders to replicate traditional and authentic tasting recipes. Jamaican Curry Powder Recipe - Taste The Caribbean! Only $3 For All These Recipes! You have nothing to lose when buying "The Herb and Spice Mix Bible". I am so confident with my product that I am giving you a 60 day money back guarantee! Download your copy now, and start your journey towards creating wonderful herb and spice blends for fabulous tasting food. Please Note: The eBook and bonuses are in PDF format and will not be physically shipped. They are delivered as PDF files meaning you can read them on your PC OR Mac. Or if you prefer you can print them out and read them at your leisure! PS. 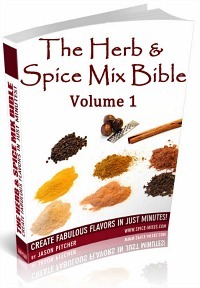 You can also get the Herb and Spice Mix Bible with 4 bonus books by clicking here. PPS. If you have any questions about the book you can contact me here. PPPS. Not ready to order?